The annual dividend is the total amount of dividend paid to the shareholders for holding each share of the company, it is paid out at the end of the financial year. The number of shares is the outstanding number of shares held by all the shareholders of the company. This number tells us how many shares are currently owned by the shareholders i.e., investors of the company. The investors can be categorized as insiders, institutional investors, and ESOPs. Outstanding shares figures are available on a company’s balance sheet. Outstanding shares can be used in the calculation of earnings per share of a company, market capitalization of a company or cash flow per share. Anand Group Pvt Ltd announced a total dividend of $750,000 to be paid to shareholders in the closing financial year. The company 200000 shares outstanding in its balance sheet. We can calculate Dividend per share by simply dividing the total dividend to the shares outstanding. Let’s assume Jagriti Financial Services paid a total of $2,50,000 dividends over the last one year, they have also provided the special one-time dividend of $47500 to the existing shareholders during. Jagriti Financial Services have 200000 shares outstanding. We have to calculate the Dividend per share paid by Jagriti Financial Services. Anand Group of Company has paid annual dividends of $5,000. Outstanding Stock at the beginning was 4000 and Outstanding stock at the end it was 6000. We have to calculate the dividend per share of Anand Group of a company. Average outstanding stock = (4000 + 6000) / 2 = 10,000 / 2 = 5000. And, the annual dividends paid were $5000. Dividends per Share = $5,000 / 5000 .
Dividend per share is the total amount of dividends issued to the shareholders for every share of equity stock by the company. In the Dividends per Share Formula, the most important point is the “Number of shares”. For the calculation of Numbers of shares outstanding, we can either find the average outstanding shares by using the simple average of the beginning and ending shares or else, we can use a weighted average. The method of calculating the Numbers of shares depends on the approach of the company, i.e. we can use the weighted average method if the company pay the dividend in the month of January and issue new shares in the month of December. The other point of the Dividend per share formula is Annual Dividend, i.e., Dividends paid to the investors over the entire year, it does not include any special dividends. However, interim dividends are included in the calculation of the Annual Dividend. Special dividends are not included in the annual dividend as it’s paid only once and it’s not a regular payment to the stockholders. Interim dividends are included in the annual dividend as they are the dividend paid to shareholders that have been declared earlier and has been paid before a company’s annual dividend payout. For an investor prospect, it is important to understand the concept of dividend per share. Dividends per share demonstrate the investors How the company uses its income. The amount of dividend paid to the Investors can be found in the financial statements of the company. For investors, the dividend per share is the easiest method to calculate the expected dividend payment amount the company will be giving. Lower Dividend per share doesn’t mean that there is no growth potential for the company. For analyzing the growth potential of any company, we need to calculate the financial ratios and the dividend yield. Dividends per share and the formula explained above can be used by the investors looking to invest in any company. Investors can evaluate stocks on the basis of pay-out of dividends and invest in the company accordingly. This formula alone cannot provide an overall view of a company’s performance as some companies retain their earnings for organic/inorganic growth instead of paying out dividends. A company with lower dividend payout ratio, i.e. a Dividend paid to stockholders (Proportion of net income) is very low, these companies will reinvest their net income which will lead to increase in the company valuation and future expansion. Dividends per share can also be used for calculating other financial formulas, Example- Annual Dividend and No. of Shares Outstanding. 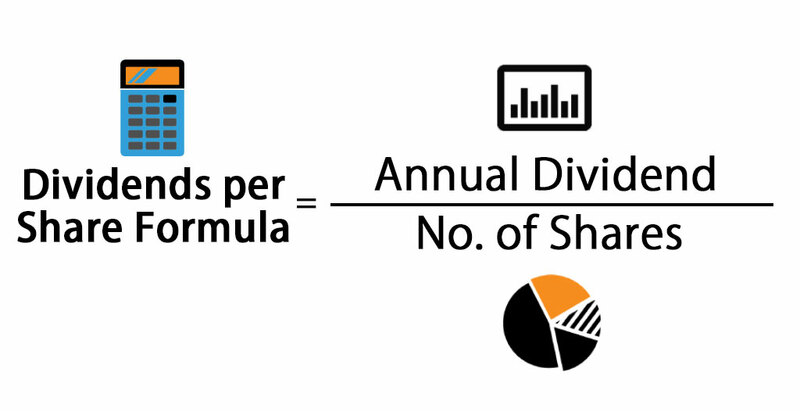 You can easily calculate the Dividends Per share using Formula in the template provided. This has been a guide to Dividends Per Share Formula, here we discuss its uses along with practical examples. We also provide you with Dividends Per Share calculator along with downloadable excel template.